Organisations are the largest consumers of ICTs and the largest producers of e-waste. But what shapes their e-waste decisions? Why do some recycle, others donate, and others dispose? Indifferent: the organisation does not adopt any strategic position in relation to e-waste. Reactive: the organisation adopts the minimum e-waste strategy necessary to react to its context. Proactive: the organisation pushes its e-waste strategy ahead of the basic reactive minimum. Innovative: the organisation sees e-waste as an opportunity and adopts an innovative strategy in order to address that opportunity. Government regulation: in particular the threat of fines and other costs associated with non-compliance with environmental regulations. Peer pressure: especially where there is some form of sectoral association. Client requirements: where these include a need for particular environmental standards or actions. Corporate reputation/brand image: given environmental actions are seen to directly correlate to image and reputation. Financial impact: the financial implications of e-waste decisions. Organisational culture/leadership: the complex of values, beliefs, assumptions and symbols which organisational leaders promote and which shape all decisions and actions. Very large firms adopted a proactive strategy, driven by significant internal and external pressures that reflected their position within global value chains. By contrast, ICT sector SMEs were largely indifferent to e-waste, felt few external pressures due to their position within localised value chains, and typically used informal channels that produced some financial return on their scrap ICT. Given these insights, what are the policy implications? Current legislative approaches – transferred from the global North and based on the principle of extended producer responsibility – are unlikely to help. e-Waste recyclers must be brought into the legislative and financial equation. SMEs must be placed within the purview of legislation (they are currently exempt), and SME associations must place e-waste onto their agenda. If you would like to know more, please refer to the journal article reporting this research, published in the journal, Information Technology for Development and available via open access: “Understanding e-Waste Management in Developing Countries”. The spreadsheet linked below provides time-series data for India’s IT industry, updating data from an earlier blog entry on Indian IT data to 2009. 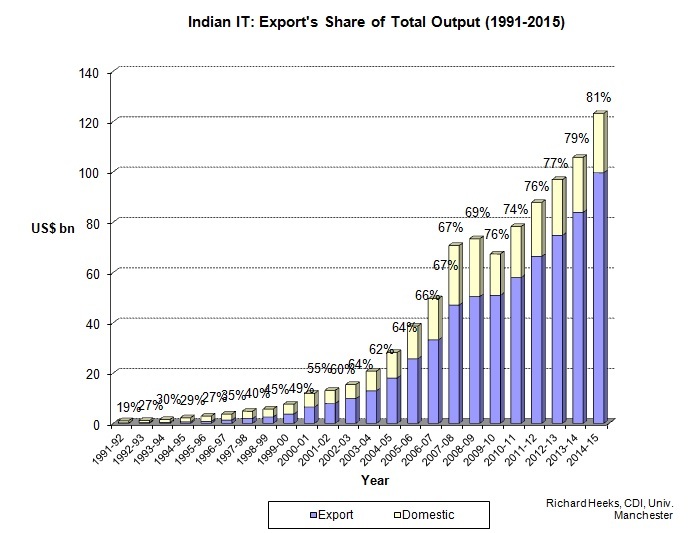 Software export figures run from 1980; overall IT outputs from 1991; and detailed breakdown from 1998 including BPO (business process outsourcing) data from 2000. Data from 2009/10 uses a different source, so changes from 2008/09 to 2009/10 are not reliable. a1) Indian software exports are huge – roughly US$75bn in 2014/15 (and c.US$100bn if BPO services are included) – and continuously registering double digit annual growth. a2) But the overall pattern of growth is slowing: the ten-year annual growth average was c.40% in 2002; c.30% in 2008; c.20% in 2014.
a3) IT software/services’ share of total exports remains roughly static: it was just under 14% in 2003/04 and just under 15% in 2013/14. a4) Market diversification for Indian software remains limited. In the early 1990s, export destinations were: US (c.60-65%), UK (c.10%), other Europe (c.10%), Aus/NZ (c.5-10%), Asia (c.0-3%). Twenty years later in 2013-14, export destinations were: North America (63%), UK (13%), other Europe (11%), Aus/NZ (4%), Asia (6%). a5) Location of production has changed. In the early 1990s, 75% of work took place on-site, 25% in India. By 2013/14, it was said that 20% of work took place on-site, 80% in India. This means that net foreign exchange earnings will have risen as a proportion of gross since offshore work requires much less foreign exchange outflow than on-site working. a6) One source claims that productivity (as measured by average revenue per employee) in the Indian software sector has risen from c.US$7,000 per head in the mid-1990s, to c.US$16,000 in the late 1990s, to US$38,000 in 2014. But my own data gives a completely different picture: that productivity in the 1990s was static at just over US$30,000 per head, and thus has risen very little during the 2000s: at best by 1-2 percentage points per year. b1) Although the Indian domestic IT market is large and growing, production for exports is growing faster than production for the domestic market. As a result, the share of exports in total IT output has risen from 19% in 1991/92 to 49% in 2000/01 to 67% in 2007/08 to 81% in 2014/15. 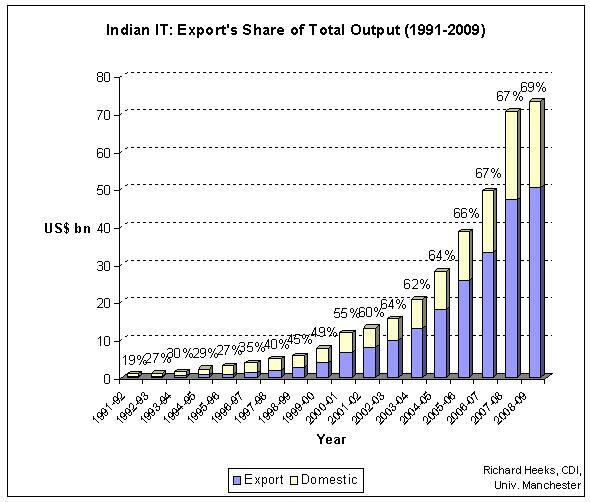 b2) IT production for the Indian domestic market and domestic IT consumption are very different. For example, domestic computer hardware production in 2013/14 was roughly US$3bn. But domestic IT consumption was US$12.4bn. In part, this may be because the two figures are counting different things (e.g. consumption figure includes peripherals, network kit, storage, etc). 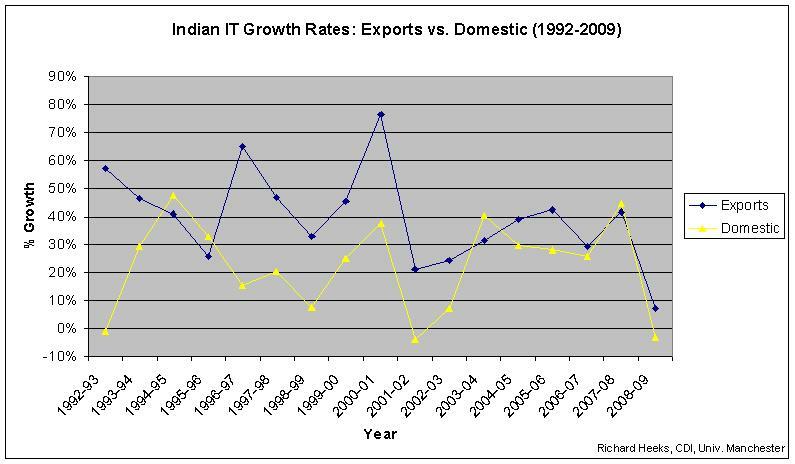 But it likely also points to a high – and said to be growing – share of imports in Indian domestic IT consumption. c1) The IT sector overall in India represents just over 5% of GDP in 2014/15. What factors shape management decision-making in IT impact sourcing service providers? IT impact sourcing means outsourcing IT work to bottom-of-the-pyramid employees with the aim of socio-economic development impact. This was the focus for a study recently conducted within the Centre for Development Informatics at the University of Manchester by postgraduate researcher, Ioannis Traintafyllis under the supervision of Dr Brian Nicholson. As detailed in a previous blog entry (“The Research Agenda for IT Impact Sourcing”), Rockefeller/Monitor research estimates that impact sourcing is already a US$4.5 billion market employing 144,000 people and “has the potential to be a $20 billion market by 2015, directly employing 780,000 socio-economically disadvantaged individuals”. The most common model of impact sourcing involves three main actors: the client, the BoP sub-contractor employees/enterprise, and an intermediary that sits between the other two and provides quality control. Examples of leading impact sourcing intermediaries – also known as ‘impact sourcing service providers’ (ISSPs) – include Digital Divide Data, Samasource, Business2Rural (India) and Daproim Africa. The ISSP is critical but we know very little about what shapes their decisions: are they driven by a moral concern for the disadvantaged of the world, or by economic gain, or something else? 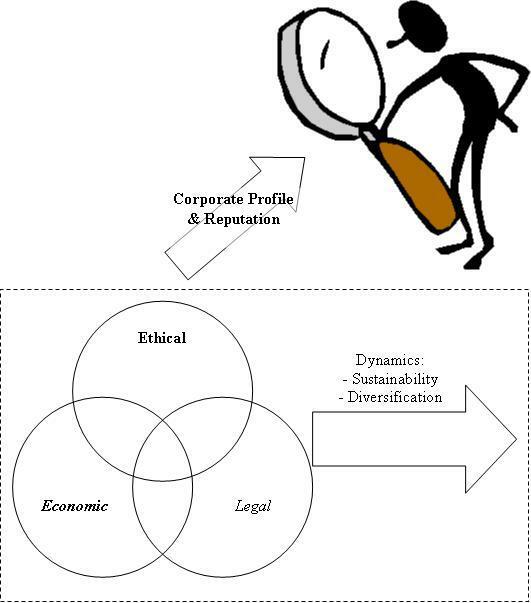 To investigate this issue, Schwartz and Carroll’s (2003) three-domain model of corporate social responsibility was used, shown in Figure 1 below. – Economic: senior managers saw the impact sourcing model as “an asset to open doors to the market” which could deliver an income stream for the company and meet clients’ needs in various ways. First “it makes sense economically for our clients” but there was also a necessity to meet client standards “on the basis of quality” and also to meet client needs “to know if we operate in an ethical, corporate responsibility way”. There was, though, a largely instrumental sense of economic factors: getting the economic aspects of the ISSP business model right was not an end in itself but a means to a wider end. – Legal: again, senior managers’ decision-making was shaped by an awareness of the legal context but as a box to be ticked; as an enabler to other ends: “we obey the legal responsibilities and the rules of the society but it is our social mission that guides our actions”. There was an awareness of the value of compliance with global standards such as the UN’s Guiding Principles on Business and Human Rights, but these had not shaped the core functions of the company; rather those core functions were already well-shaped in a way that could meet global standards. 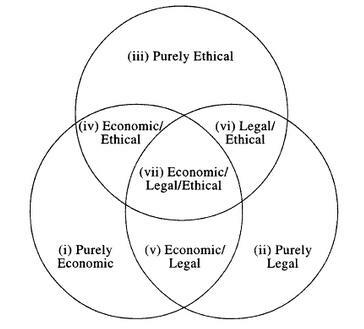 – Ethical: the main impetus behind formation of the firm, and the foundation for decision making was the impact of contracts in providing jobs, skills and incomes for those from disadvantaged backgrounds in developing countries. In philosophical terms, this was more a consequentialist than deontological morality: driven by the outcomes of the firm’s actions rather than by some deeper and shared moral code. Two other elements, though, were notable in the responses of senior executives, which reflect some of the specifics of the ISSP business model. First, this is as yet a relatively new, small and fragile business model. Senior managers were therefore continuously concerned about sustainability of the business model and of the company. As a concern, this had pushed diversification – of both client domains and outsourcing locations – as a strategy. Diversification can be read as both economic and ethical in its origins, though an issue for all ISSPs will be whether – over time – there is a tendency for the balance to shift from the ethical to the economic. Second, all domains and issues – economic, legal, ethical – were continuously filtered through the lens of corporate reputation and profile. Managers knew clients, in part, signed up because of the positive image of impact sourcing; but would walk away if impact sourcing got a widespread ‘bad press’. Their foremost legal concern was to ensure external awareness of compliance. And they were keen to share stories of individuals who had been helped by impact sourcing; stories being the type of data that readily lends itself to good PR. This is only to be expected. In conceptual terms, as with other types of fair trade, clients do not have direct access to the context of production. The ISSP is an agent acting on behalf of their client/principal. As a result the link between client and BoP subcontractors is almost entirely mediated by trust, image and reputation of the ISSP, and by the wider media portrayal of impact sourcing. This would necessarily make ISSPs most concerned about the appearance of processes and impacts. The importance of external image is reinforced because impact sourcing intersects two business models – fair trade and IT offshoring – both of which have come in for strong, at times intimidatory and vituperative, criticism; particularly in the US. We can therefore revise the basic triorbital model (see Figure 2) to show its dynamics over time which lead sustainability and diversification to shape decisions; and to show that all issues are always filtered through a reputation/profile lens, affecting not just external communications but also internal decisions. The base of data used here is very limited, so much remains to be researched, but we hope this model can form the foundation for future study. Analysis can probe the relative weights of the three domains, including the potential for changes in those weights over time. Research can also look at the difficulties of managing in a field in which appearance may matter more than reality. What determines the success or failure of IT ‘impact sourcing’ relationships? We have known for some time that various factors affect the outcome of IT outsourcing relationships. But no-one has yet applied this to IT ‘impact sourcing’: outsourcing to bottom-of-the-pyramid employees with the aim of socio-economic development impact. This was the focus for a study recently conducted within the Centre for Development Informatics at the University of Manchester by postgraduate researcher, Sheng Lu under the supervision of Dr Brian Nicholson. The most common model of impact sourcing involves three main actors: the client, the BoP sub-contractor employees/enterprise, and an intermediary that sits between the other two and provides quality control. This creates two relationships: client—intermediary; and intermediary—BoP sub-contractor of which the former will be the main focus here. Some have been more factor-oriented. For example, Lee and Kim (1999)[i] argue that trust, business understanding, benefit and risk sharing, conflict, and commitment are factors that influence the relationship. Some have been more process-oriented. For example, Kern and Willcocks (2002)[ii] take an interactional approach that focuses on different types of exchange that occur during an outsourcing relationship. 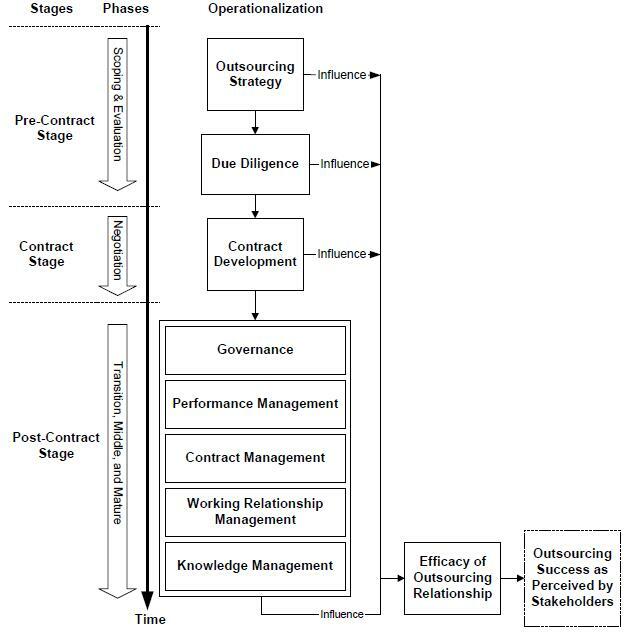 The model chosen to explain IT impact sourcing was Alborz et al’s (2003)[iii] IT outsourcing relationships model, shown in the figure below. Alborz et al’s model was selected because it integrates a number of earlier models, and combines both process- and factor-oriented approaches. The model was tested through a review of IT impact sourcing case study secondary data, and through development of primary data from two interviews, providing a client- and intermediary-side perspective from one of the largest IT impact sourcing intermediaries, with operations in a number of developing countries. – Due diligence 1: clients select IT impact sourcing intermediaries on a quadruple-criterion basis of cost, delivery timescale, perceived quality of service, and social mission. The latter may be perceived in terms of alignment with the client’s own mission statement (a number of clients themselves have, in part, a social mission). The outsourcing activity may also be given a higher profile by the client than traditional IT outsourcing; for example, in annual reports or corporate social responsibility statements. This pressurises impact sourcing intermediaries to maintain a strong public image of corporate and developmental responsibility. – Due diligence 2: supplier development encompasses not just the intermediary, but also the terminal sub-contractors at the bottom of the pyramid. These are selected from poor areas or communities, trained and screened for both service quality and social impact by the intermediary. – Contract development: in some cases (though not all) social impact indicators may be written in to the supplier—intermediary contract. – Governance 1: the social mission within IT impact sourcing may provide a hook that snags greater senior management support from the client than traditional outsourcing, but it may also create a gap in understanding and knowledge that must be bridged. – Governance 2: the style of relationship management must, at least initially, be one that incorporates more patience and latitude than required within some traditional IT contracts. Information and knowledge gaps are particularly significant between client and BoP sub-contractors, and all actors tend to be on a learning curve since impact sourcing is too new to contain significant repeat business. But repeat business is growing and there seems to be a general assumption that clients, intermediaries, and BoP sub-contractors will be forming long-term contractual relationships. – Performance management: as with contract development, this may include monitoring of the socio-economic impact of the contract within the developing country. – Management of the working relationship: trust is a key factor. But not just trust that the IT services will be delivered on time, on cost, on quality but that any explicit or implicit social impact will be delivered and – more importantly – than any implicit corporate reputational gains will also be delivered. Once again, this emphasises the greater scrutiny that impact sourcing value chains may be subject to compared with traditional IT outsourcing, and the consequent need for intermediaries to exercise care over their reputation and image. In sum, the limited base of data means this is only a proof of concept that indicates the potential relevance of the model, and points the way for future study. Within those limits, it appears that Alborz et al’s model can be applied to help understand IT impact sourcing relationships. While the core stages and elements work as specified, the context of IT impact sourcing and the influence of social mission mean that specific issues do arise. We hope that the model will be used for further research, exploring in more detail the processes and factors that underpin success – or failure – of IT impact sourcing relationships. The model can also be used by impact sourcing practitioners as an analytical tool to assess their own client—supplier relations either before or during contract implementation. Analysis can investigate each of the components of the Alborz et al. framework, adding in the social mission modifications indicated above. [i] Lee, J.N. and Kim, Y.J. (1999). Effect of Partnership Quality on IS Outsourcing Success: Conceptual Framework and Empirical Validation. Journal of Management Information Systems 15(4), 29-61. [ii] Kern, T. and Willcocks, L.P. (2002). Exploring relationships in information technology outsourcing: the interaction approach. European Journal of Information Systems 11(1), 3-19. [iii] Alborz, S., Seddon, P.B., and Scheepers, R. (2003). A Model for Studying IT Outsourcing Relationships. 7th Pacific Asia Conference on Information Systems, Adelaide, Australia. 10th-13th July, 1297-1313. So, what is “impact sourcing” and why is it important? Exploitative outsourcing seeks to bear down on wages and working conditions in order to minimise costs and maximise profits. Commercial outsourcing is a mainstream approach that reflects the steady diffusion of outsourcing from cities to large towns to small towns and beyond. Ethical outsourcing (also known as socially-responsible outsourcing) takes commercial outsourcing and requires that it meets certain minimum standards; typically relating to labour practices but also starting to include environmental issues. Social outsourcing (also known as developmental outsourcing) differs from ethical outsourcing as fair trade differs from ethical trade. Ethical outsourcing involves existing commercial players with either a commitment to or measurement of adherence to standards. Social outsourcing involves new non-market intermediaries who sit between the client and the BoP supplier. As shown in the diagram, “impact sourcing” is a rather loose agglomeration of a number of these models, defined as “employing people at the base of the pyramid, with limited opportunity for sustainable employment, as principal workers in outsourcing … to provide high-quality, information-based services to domestic and international clients” in order “to create sustainable jobs that can generate step-function income improvement”. Report authors Monitor estimated that impact sourcing was already a US$4.5 billion market employing 144,000 people and “has the potential to be a $20 billion market by 2015, directly employing 780,000 socio-economically disadvantaged individuals”. Rockefeller has subsequently set about funding and encouraging significant growth in this market. The various terminologies can be confusing and, personally, I prefer the more immediately-meaningful “BoPsourcing”. However, this new model is clearly already sizeable, and likely to be growing fast in future. It also – despite the absence from the name – has IT as a foundation: all these types of outsourcing are IT-based and IT-focused whether they involve data entry, digitisation, back-office processing, search engine optimisation support, etc. In that case, where is the research on impact/BoP sourcing? The answer is: almost entirely absent as yet. The journal article on “Social Outsourcing as a Development Tool” is a rare exception, which traces the developmental impact of one initiative using this new model. In that case, what research should we be doing: what is the impact sourcing research agenda? A helpful guide comes from two articles recently published in the Journal of Information Technology by Mary Lacity and colleagues: “A Review of the IT Outsourcing Empirical Literature and Future Research Directions” and “Business Process Outsourcing Studies: A Critical Review and Research Directions“. These papers review the literature to date on IT outsourcing overall, and on BPO specifically, summarise that literature in an overview model, and propose a future research agenda. 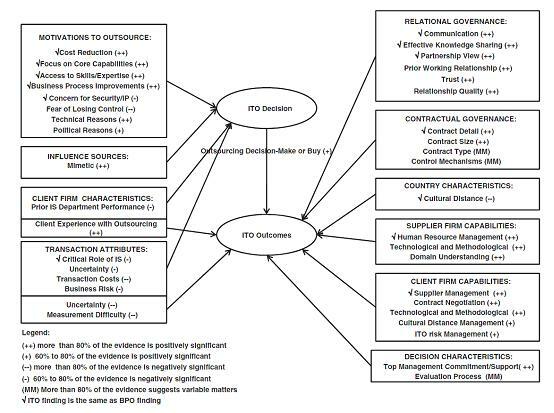 Figure 2 – from the first article – summarises the review of IT outsourcing research (including overlaps with BPO research), which boils down to the factors which affect outsourcing decisions by client firms (e.g. whether to outsource or not; or what type of contract to use), and the factors which affect the outcomes of outsourcing (typically the outcomes for the client firm or its relationship with the supplier). Given the lack of existing work on impact sourcing, all these relations are yet to be investigated, so Figure 2 already sets a sizeable research agenda. However, we can tease out more in three ways. First, because Lacity et al lump rather a lot together into the “outcomes” category. The nature of the client-supplier relationship is better understood as part of the process by which outcomes are achieved. From this, we can identify a set of outsourcing process research that could be applied to impact sourcing – from the “COCPIT” approach to maximising client-supplier relations in IT outsourcing, to work on the development of intermediaries in IT outsourcing relations. Treating decisions as key inputs, the research agenda can be shaped around an Input – Process – Outcome structure. Second, because the Lacity et al map is of past research. Their papers also identify generic IT outsourcing research priorities for the future that will apply equally to impact sourcing, including the effect of broader environmental factors on client decisions, such as public attitudes; the capabilities required within suppliers; and the different financial and business models being used. Needs and means for building capabilities within BoP suppliers. A broader typology of business models that spans the boundaries of traditional business and traditional development. The requirement to judge business models in terms of their accessibility (to lower-income groups), ethicality (e.g. providing a decent income for the suppliers involved) and sustainability (for BoP suppliers, their clients and the intermediaries). Understanding that clients may want more than just a financial bottom-line outcome from impact sourcing. Analysing the developmental outcomes of impact sourcing, including the effect on the livelihoods of individual suppliers. Putting all this together, we get the research agenda summary shown in Figure 3. Inputs and Processes: transaction cost economics can provide a quantitative basis for exploring decisions and business models; resource-/capabilities-based perspectives on organisations offer a more qualitative route (see Mahnke et al 2005). Outcomes: the livelihoods framework or Sen’s capability approach can be used to assess the developmental effects of impact sourcing. Beyond these initial pointers, though, there are many other theoretical foundations waiting to be used. If you identify some gaps here – i.e. some other priority research issues that need to be addressed, or some other theoretical models that will be appropriate to apply to impact sourcing – then do add your thoughts. BoPsourcing: Fighting or Fuelling Inequality? BoPsourcing – the outsourcing of work to bottom-of-the-pyramid communities – is on the rise. Outsourcing used to mean sub-contracting work from one big firm to another nearby. Then, with offshoring, the contracts crossed borders. With BoPsourcing, the contracts cross several income strata as well. All these, and many other examples from India, are onshore BoPsourcing. There are also offshore varieties, such as Digital Divide Data, which outsources from large US organisations to telecentres in Cambodian small towns and villages. BoPsourcing has no necessary connection with ICTs. Indeed, many agricultural value chains are arguably examples. Here, though, my focus is on ICT-related outsourcing. Examples of contracts include data entry, transcription, digitisation, call centres and ICT training. One of the key concerns about outsourcing and developing countries has been the potential to fuel income and other inequalities. I could already see this studying software offshoring to India in the 1980s: an economic shearing in which those involved saw their incomes pull far ahead of the bulk of the population. More recent evidence suggests offshoring increases overall wage growth but also increases inequality. BoPsourcing presents an obvious solution. Channelling the benefits of outsourcing down to the poor can drive wealth creation for those on the lowest incomes, and serve to reduce inequalities. So. Job done. We can add BoPsourcing to our list of great development solutions. Well, not quite yet. First because the evidence base is very weak. Second because BoPsourcing comes in nearly as many varieties as Heinz. Figure 1 summarises. Exploitative outsourcing seeks to bear down on wages and working conditions in order to minimise costs and maximise profits. The result is an ICT sweatshop that does little to grow incomes, to deliver empowerment, or to reduce inequality. At present this seems more of a bogeyman brandished by those at the other end of the continuum, than it is an evidence-based reality. The potential, though, is certainly present with so many outsourcing firms seeking to drive down costs. Commercial outsourcing reflects, for example, the steady diffusion of outsourcing in India and other nations, from cities to large towns to small towns and beyond. Whether this can yet be called BoPsourcing (e.g., forgive the pun, whether BPO is BoP) is unclear. Quite likely commercial operators have to date only got as far as large towns. But the migration trend is clear, and it will reach poorer towns and even villages soon enough. As for inequality, the effect is likely to be as arguable as it is for outsourcing generally: evidence is contested and, unfortunately, fought more by economists pitting ever-more complex models against each other, than on the basis of field data. Ethical outsourcing (also known as socially-responsible outsourcing) takes commercial outsourcing and requires that it meets certain minimum standards; typically relating to labour practices but also starting to include environmental issues. The International Association of Outsourcing Professionals has taken a lead on this. This is likely to have some impact on inequality but, again, the extent to which such work really reaches the BoP as yet is questionable. Social outsourcing (also known as developmental outsourcing) differs from ethical outsourcing as fair trade differs from ethical trade. Ethical outsourcing involves existing commercial players with either a commitment to or measurement of adherence to standards. Social outsourcing involves new non-market intermediaries who sit between the client and the BoP sub-contractor. Social outsourcing most definitely does reach the BoP; indeed that is its raison d’être. It has already been shown to increase incomes, increase asset holdings, increase skills, and increase empowerment. It is therefore likely to reduce inequality. True ICT BoPsourcing is on the increase – you only have to monitor the growing number of initiatives to see that. Much of the more commercial end of outsourcing has yet to get this far. It’s more like MoPsourcing (i.e. middle of the pyramid) just now, but cost pressures, supply-demand gaps, ICT diffusion, and growing awareness of BoPsourcing mean this is changing. The impact of these trends on inequality will depend on which outsourcing model comes to dominate the BoPsourcing business. If social outsourcing wins, then so too will the poor. If exploitative outsourcing wins, the opposite will be true. In practice we may well see some messy combination of models, as social and commercial approaches intersect. For the social outsourcing intermediaries, the lure of big clients, contracts and growth may pull them into bed with commercial operators. Conversely, the operators will be attracted by the contacts, expertise and CSR-window dressing that social intermediaries provide. The poor themselves will get jobs, skills and income. Whether they will see the structural transformation necessary to really clobber inequality, only time will tell. The spreadsheet linked below provides time-series data for India’s IT industry: software, hardware and services revenue for both export and domestic markets. 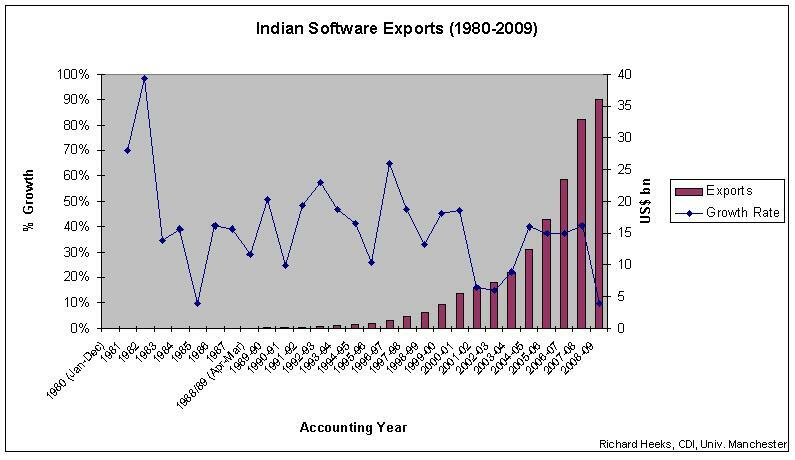 Software export figures run from 1980; overall IT outputs from 1991; and detailed breakdown from 1998 including BPO (business process outsourcing) data from 2000. Although software and IT services tend to grab the headlines, other sub-sectors are significant: with hardware worth US$9.5bn (nearer US$12bn if one includes hardware design) and BPO worth more than US$13bn in 2008/09. Total revenue for India’s IT industry in 2008/09 was US$73.4bn. The source for the data used is a mixture of interviews in India and Department of Electronics/IT reports for the earlier data up to late 1990s; and the invaluable Dataquest (India) annual review of the IT industry (the “DQ Top 20”) from that point on.